Stats are attributes that affect player abilities. Stats can effect health, energy, offensive power, defensive power, and environmental defense. 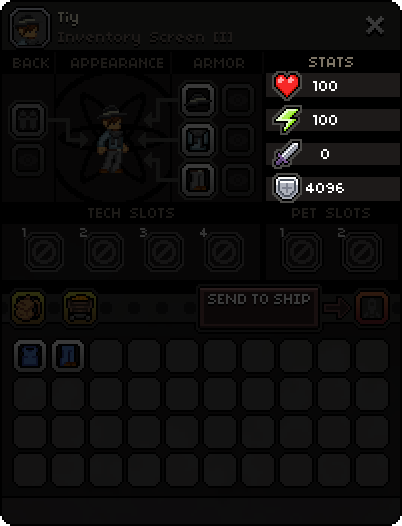 There are also consumable items that exist in game that can enhance stats. Health - The player's maximum health pool. Increasing the health pool does not increase your current health, and decreasing it will remove any excess health. Energy - The player's maximum energy pool. Increasing the energy pool will allow your energy to slowly fill up, and decreasing it will remove any excess energy. Energy Regeneration (Not shown) - The rate at which the player's Energy regenerates. Increasing this stat will allow the energy pool to refill faster. Attack multiplier - The base DPS (Damage Per Second) multiplier of any held weapons. Holding two one-handed weapons (i.e. two Hunting Knives) will multiply the damage of each weapons' DPS by the displayed %. Defense - The amount of incoming damage nullified. Shields greatly reduce damage while active as well. However, damage by fire, poison, or harmful obstacles (such as the Sawblade Trap) is not reduced by defense. Warmth (Removed) - The player's ability to resist cold temperatures. Standing near warm objects such as a Torch or Campfire will aid further in keeping the player warm. This stat was removed in update Upbeat Giraffe. This page was last modified on 18 July 2016, at 21:59.